Here's a short mocha homecoming dress with shimmering details that allows you to shine like the star you are. This gorgeous party dress features a stylish off-the-shoulder bodice with scattered rhinestones on gleaming embroidered applique. An illusion inset provides support at the deep v-neckline, while embroidered banded sleeves drape over the shoulders to the sheer corset-style back of this stylish short dress. Rows of sparkling rhinestones and tonal beading define the natural waistline as they top the fully-lined chiffon skirt that flows away from the hips to a short hemline. 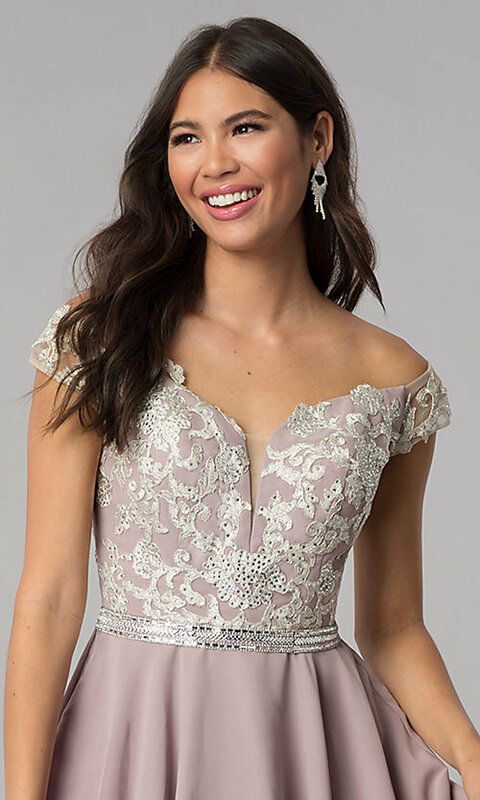 Positively delightful for hoco 2019 and wedding receptions, this short mocha homecoming dress is a dazzling style for your semi-formal event.